2015 Wildlife Habitat Award winner. Dennis Reamer will receive the 2015 Wildlife Habitat Award on Feb. 1 at the annual Osage County Conservation District dinner and meeting in Osage City. This award recognizes individuals who have excelled in improving wildlife habitat on their land in addition to conserving soil and water resources. The award is sponsored by the Kansas Bankers Association and the Kansas Department of Wildlife, Parks and Tourism. Dennis bought 400 acres just south of Burlingame in 2007 with the idea of developing wetlands on the flat bottom land located just east of Dragoon Creek. Dennis is originally from the Silver Lake area. When Dennis was looking for property, he wanted land which he could develop the wildlife habitat on and provide hunting and outdoor recreation opportunities for his kids and grandkids. Dennis also has property in Shawnee County near Silver Lake, which was awarded the 2009 Shawnee County Wildlife Habitat Award. 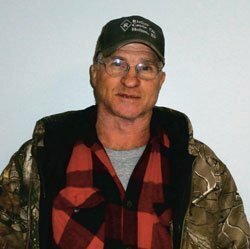 Dennis has a deep interest in providing wildlife habitat and has spent countless hours of his time improving his properties for future generations. Since 2007, Dennis has been busy working on multiple projects. Some of these include planting 65 acres of poor cropland to native warm season grasses in 2008. He now grazes cattle on this warm season acreage along with several cool season pastures. Adequate cover is left each year to provide nesting cover for grassland species such as bobwhite quail. In addition, Dennis has planted hundreds of American plum seedlings with the goal of providing important escape cover for bobwhite quail. He has also transplanted many suckers from these original plantings to other areas of his farm. Dennis conducts periodic prescribed burns on his property and also recognizes the importance of broadleaf plants like sunflowers and ragweed as important food and cover plants for quail. Dennis’ most recent addition to his property has been the completion of two wetlands, which when full will total approximately 30 acres. Dennis completed these wetlands by signing a permanent Wetland Reserve Program easement administered by the Natural Resources Conservation Service on 133 acres. Through WRP, NRCS planned, designed, and funded two dikes with associated water level control structures used for water level manipulation. The wetlands and associated area around them will be managed to maximize wildlife habitat. An additional 25 acres of native warm season grasses and forbs have recently been planted on the former crop land. Thirty-eight acres of unbroken bottomland tallgrass prairie, which is a unique feature found within the easement, will permanently be protected from plowing. It will be managed through prescribed grazing and burning to maintain the species diversity found within this unique native grassland. While he has completed the initial development phase on the WRP acreage, Dennis is not finished. He has plans for additional shrub plantings, food plots, and downed tree structures throughout his property. Dennis appreciates the fact that quality wildlife habitat needs continual management and will be busy in future years conducting prescribed burns, managing cattle grazing, and controlling noxious weeds to name a few. Dennis is excited to see his dreams come true as wetlands fill, grasslands develop, and wildlife find the newly developed habitats. Dennis is a true private wildlife manager as he takes into consideration the habitat needs of wildlife in all of his farming and ranching decisions.